Much of the Internet is going dark today in protest of the Stop Online Privacy Act (SOPA) and its counterpart Protect-IP Act (PIPA). SOPA was originally introduced as a way to stop copyright infringement, but it won’t do that. What SOPA will do is threaten the freedom and the stability of the Internet, as well as your ability to make a living off it. SOPA requires that sites like Google, Twitter, Facebook and other key Internet players monitor the Web and police content that may infringe on someone else’s copyright. Sites that are accused of violating SOPA will be shut down, without due process. For example, if you tweet a link to a YouTube video, Twitter could be forcibly shut down. If you quote someone’s article on Facebook, Facebook must censor you or risk its own site. If YOUR SITE is accused of violating someone’s copyright, you could lose your livelihood. Again, with zero due process. It’s legislation that puts far too much power in the hands of the government. Why are the online protests happening today? Because the Senate will begin voting on January 24th. How can you fight SOPA/PIPA and protect the Web? First, watch this video and help understand what’s at risk and what SOPA will really do. Fight for the Future breaks down how the Stop Online Privacy Act (SOPA) and Protect-IP Act (PIPA) threaten the freedom and stability of the Internet. The government and corporations can block any Web site, foreign or domestic, for one infringing link, without due process. Social media sites will either be forced to censor its users or they risk being shut down if a user posts something the government deems infringing. With no due process, the government can push this as far as it wants. Or, perhaps, as far as we’ll allow it. The video above does a fantastic job breaking down all the key points of the bill in language even if your mother will understand. An Open Letter to Washington, signed by founders of FireFox, Google, Twitter, Flickr, Yahoo, LinkedIn, The Huffington Post, Paypal, Craigslist, Wikipedia, etc. When you’ve had enough, go here: https://www.google.com/landing/takeaction/. When you land there, sign the petition. What else can you do? 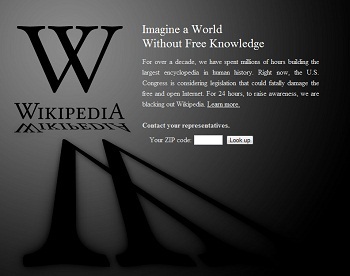 Use this page to locate and then call your elected officials and tell them you oppose SOPA and PIPA. In the coming elections, don’t support any candidate that supports these dangerous bills. Don’t be fooled. I know there aren’t too many online petitions and protests that have much merit, but this one affects all of us. It affects our sites, our businesses, and our livelihood. Home › Internet Marketing Blog › Online Marketing › Day of Darkness: How Can You Help Fight SOPA/PIPA?